Putting you at the center of the story...literally! 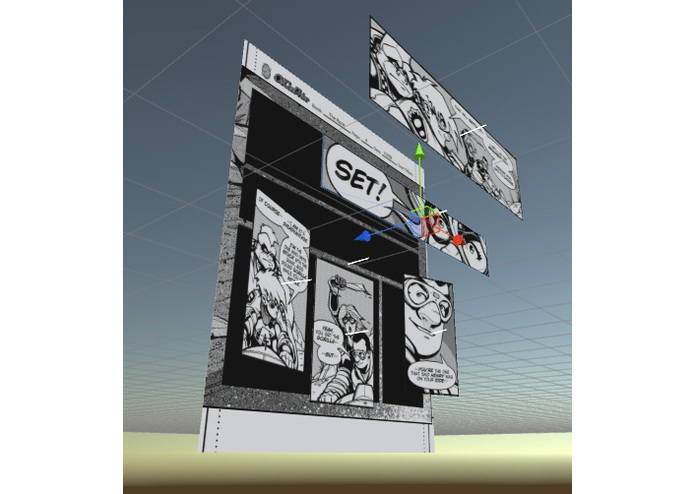 VR Team Robotica is building a unique comic book reading app that attempts to destroy the boundaries of traditional comics while keeping the essence of the experience. Freeing the artist from the physical constraints of the page; the forced linearity of time ; and even the perceived absolutes of physical orientation. 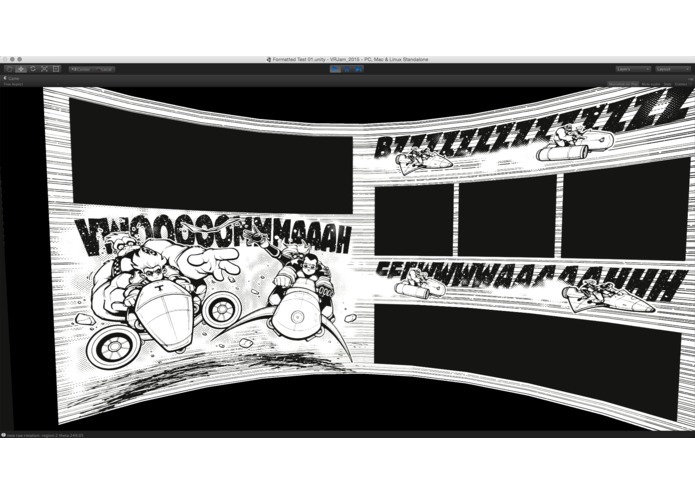 Comic panels are presented as arcs on an infinite continuous cylinder; a story may span 9000 degrees of physical cylinder space. A 360 degree image could be stretched to 370 physical degrees, causing a 10 degree disorientation in the user. Story progression can rotate to the right, left, or a discontinuous mixture of both. Our format opens up the possibility to break convention and force the user to explore the panels to find progression event triggers to move the story forward. Imagine following a character to the top of a mountain then having a fixed 360 view from the mountain top that now repeats as you continue spinning to the right. The story does not progress until you start spinning back to the left, and you now observe the character hiking down the mountain. We break the boundaries of space, time, and orientation and create a new medium for non-linear, unbounded expression for the comic art form. Did you hear a sound in your left-ear? Is that a bird over head? What's that object at your feet? Look, to move the story forward. The user is not restricted to reading left-to-right; with the appropriate storyline, the user can participate in which direction they choose to read, and the author can craft a means to motivate particular interactions to influence how the user experiences those stories. This is a Comic Book Reader Revolution! 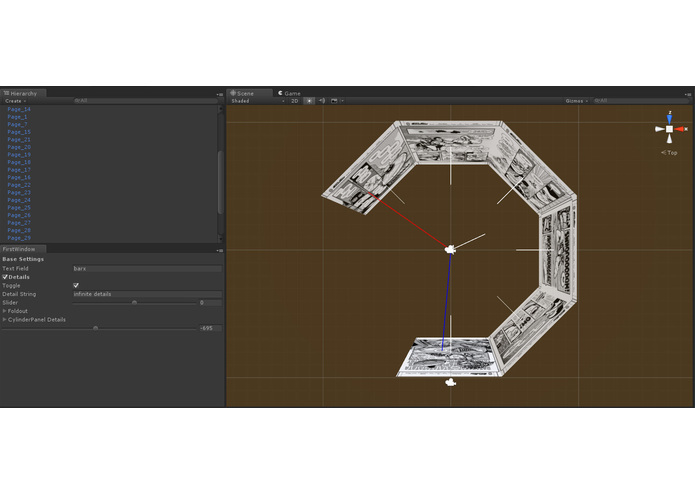 Using Unity 5 as our development platform for this experiment, we created an automated panel layout generator that established the size of the images and placed them at a specified radius from the user. We allow for either flat panels or curved panels that arc in a perfect cylinder surrounding the user. The user's cameraController then has it's frustum and focal angles that determine when panels are created and destroyed, so that the user perceives a continuous, uninterrupted progression of story (clockwise moves forward and counter-clockwise moves backwards). Linear story lines and non-linear story lines. Each panel maintains a position along the circumference of the cylinder and a particular time frame (for birth, time, and death). Simply progressing forward counts the frames up, from 1 to the end, linearly. But, we can also customize an individual panel's position and time, so that the user has to move in the opposite direction to continue the story. This does however require content that is custom made (or easily adaptable) for such a transition. We have this feature, but the content was not quite created in time for the milestone 4 deadline. 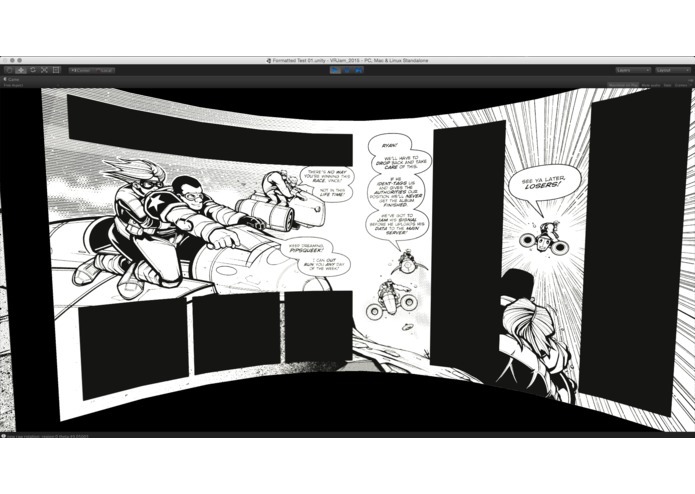 Triggered Sound Cues that activate when a panel is born, gains focus, loses focus, and dies. This adds a depth to the experience that helps to bring life to the visuals, without trying to detract from the traditional aspect of comics (we're not trying to build "motion comics"). This feature has a simple start, but was not stable for the final release. Animated Transitions to add flare to the creation and destruction of each panel. 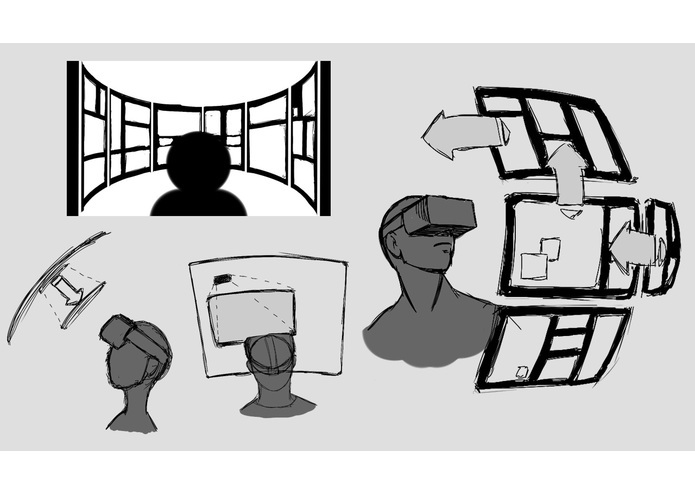 The traditional experience of books centers around the turning of pages, VR offers a unique perspective that we wanted to experiment with and create a new experience. This feature will have to wait for the next version. Triggered Timeline Events to further the non-linearity of the stories, we really tried to implement trigger points to move our timeline events forward, making things like word bubbles appear in sequence, rather than all at once. This will have to wait until the next version. Streamlined Production Pipeline having done this much, we have learned of a few necessities that will help us optimize future comic conversions. So it looks like my Parallax Test will not build for Android. Too bad, it was the best looking part for the Jam. :-( For those interested, you can see it in all its glory in the Windows Build, which I'll be uploading shortly. 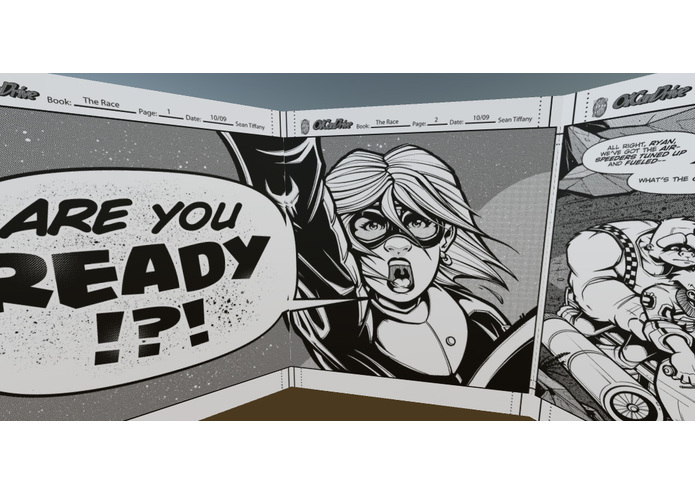 I designed and implemented the start screen (using some existing assets, Unity's new UI features, and a tiny bit of C#), and helped by cutting up comics in Photoshop so they could be sen in stereoscopic 3D! Whelp, I guess the app is not loading properly in Android and we don't have time to fix it, so we're not going to make the final round of judging. Bummer. 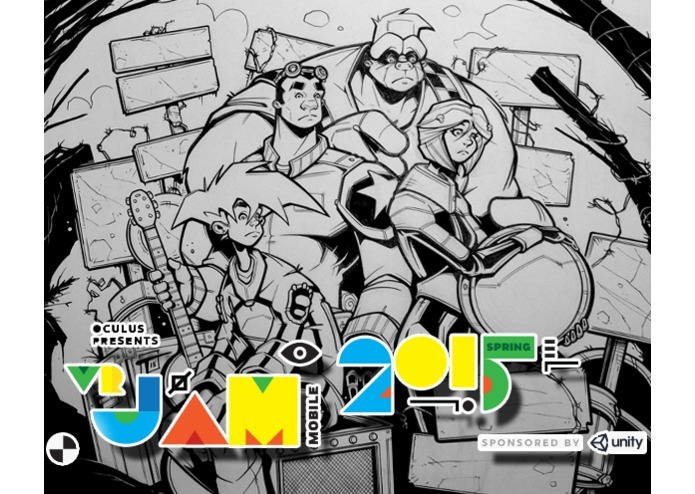 But have no fear, we are targeting a more polished demo for next week's Denver Comic Con where we'll have users try it out live on the floor in Artist's Alley. 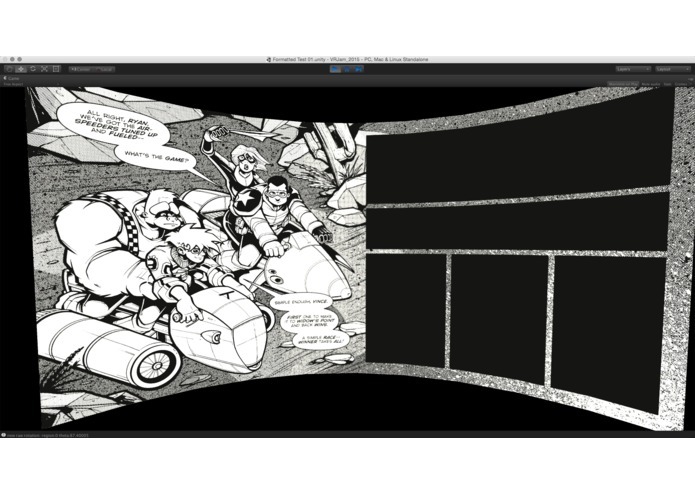 And perhaps we'll solicit other artists to have their content ported to VR using our Comic Book Reader Revolution tools. 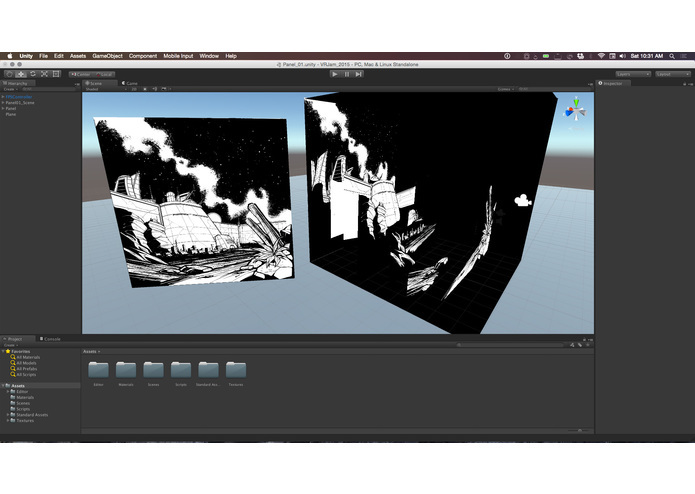 We'll get this app on to the GearVR store once this thing gets a professional shine.